I observed this very bright sphere ongoing every night since the 29th May. It appears in the West then slowly sinks towards the North. I thought OK some planet like Venus but this is 10x bigger and brighter than any planet seen in the sky. 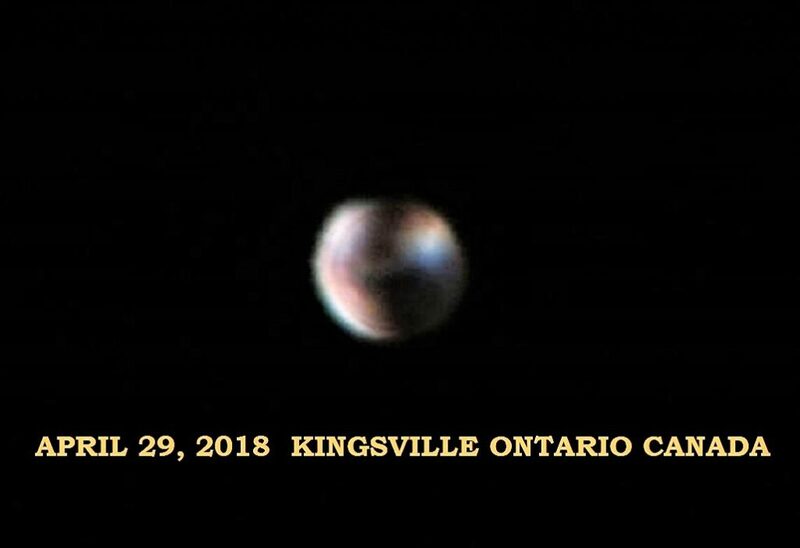 What struck me is now for two nights there has been intermittent cloud cover and even storm clouds and although it may disspear for a few seconds it reappears with no other stars, not even the moon able to penetrate the thick cloud cover but this sphere shines through the thick cloud. 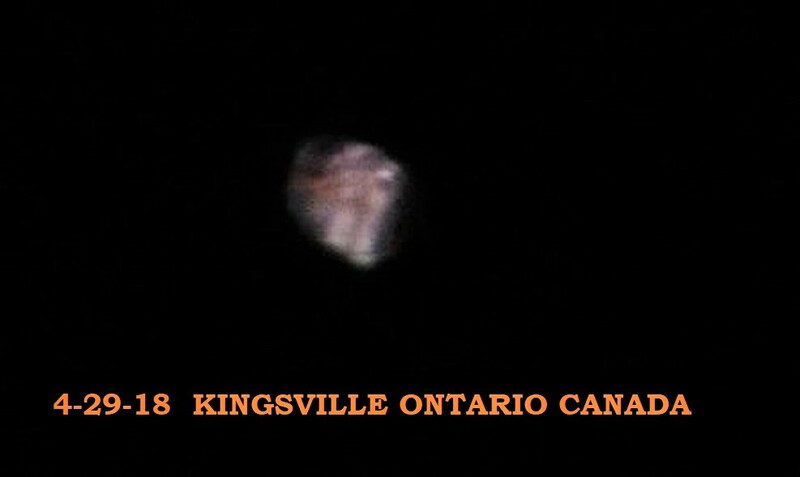 So I then concluded it has to be a UFO in a lower orbit or so bright it shines through even thick black thunder clouds. This is ongoing! Hi Ken : I was watching television when I felt compelled to go outside.. I thought to myself I am not going out there in the dark for some reason I felt frightened then all of a sudden I heard a voice say “go outside your be ok” I grabbed my Nikon P900 camera and put my shoes on and went out into the back garden. I looked around the sky for anything out of the ordinary but there was nothing unusual to be seen. It was a clear starry night I looked around to the south and I was delighted to see a beautiful bright crescent moon. I took some photographs of the moon and then looked around the sky once more before heading back towards the back door. I touched the back door handle and felt the urge to look to the east towards Buckland and in the sky above the centrax factory that was acquired by MB Aerospace there was a Fiery bright light that was out of place in the sky that seemed to have appeared out of nowhere. I immediately zoomed in with my Nikon P900 camera and was shocked to see inside the fiery bright light there were geometric shapes that at first took on the form of what looked like a castle. The geometric shapes then appeared to be moving around taking on many different forms. I was gobsmacked I immediately started to take photographs of this very strange anomaly. The Fiery anomaly started to ascend and move to the right and then to the left before it shot off at great speed covering a vast amount of distance in a second. Now in the distance the Fiery anomaly was still visible and I watched as it flew up into the sky and disappeared. 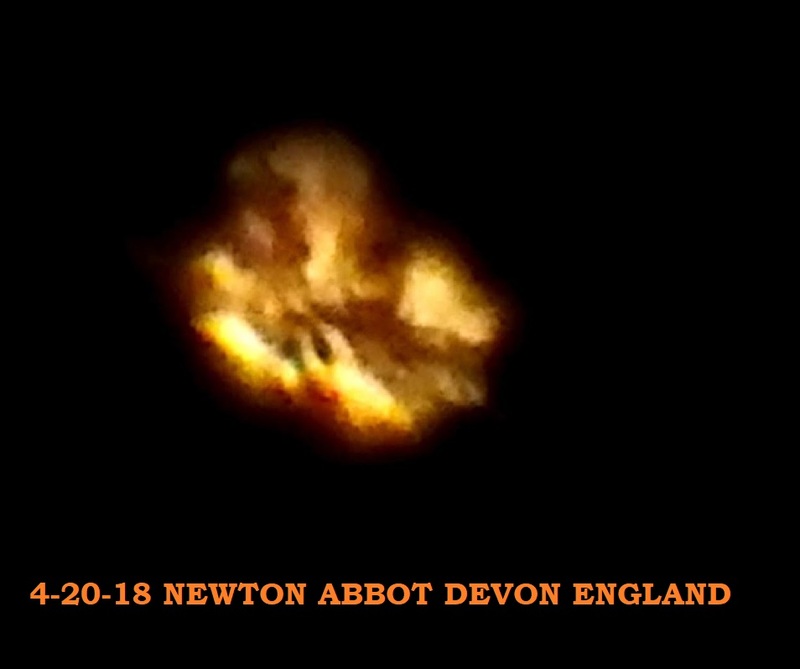 The photograph were taken on the 20 ‎April ‎2018, 10:29 PM at Newton Abbot Devon England. All the best John. 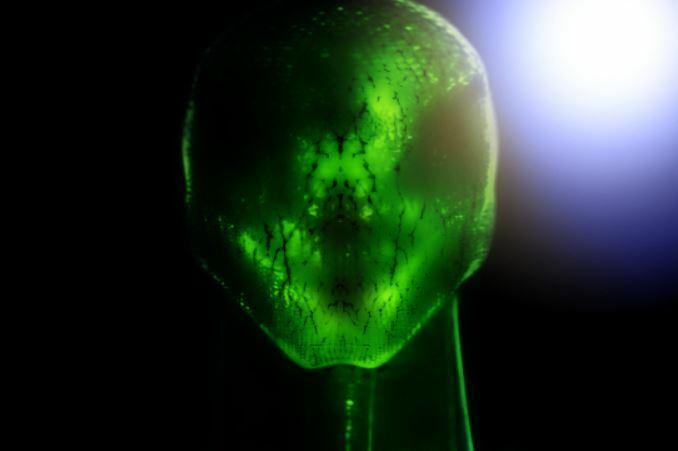 In Puerto Rico I saw one of those (a strange man with translucent skin who didn’t appear human). I was 20 years old when it happened, now I’m 39. I really think it was an alien. It could not walk that well, a few things got my attention. It had the right hand in the left. What I mean, the fingers were backwards. Where there was supposed to be the pinky was the thumb. It also walked with difficulty and when I look at its feet I saw that were the same as his hands, in the wrong place. The skin was was translucent… it looked really weak. I didn’t feel scared. I just felt calm and with the need to go where it was. When it talked to me, it was talking part with its lips and part in my mind. It asked me if I knew where the the Arecibo Observatory was. The Arecibo Observatory is a radio telescope in the municipality of Arecibo, Puerto Rico. It is also the biggest in the world. I didn’t have time to answer when I saw a blue flash of light and I black out. I woke up sitting on the balcony of my house two hours later. When I saw it it was 11:00 pm and when I woke up it was 1:00 am. I would like to be hypnotized to know what happened to me during those two hours of lost time. I live in Philadelphia now. But I have a house in Puerto Rico where that happened. That’s one of my crazy experiences.” NOTE: The above image is CGI.